Vietnam and China have reached a consensus on further prompting their comprehensive strategic cooperative partnership in the new situation. The consensus was reached during talks between Prime Minister Nguyen Xuan Phuc and Chinese Premier Li Keqiang in Beijing on September 12 following the welcome ceremony the same day. Accordingly, both sides agreed to maintain bilateral friendship and mutual respect, increase strategic exchanges, reinforce political trust and deepen mutually-beneficial cooperation by controlling and settling remaining differences and arising issues satisfactorily, for the practical benefits of their people and contributing to promoting peace, stability and development in the region and the world. PM Phuc asserted that Vietnam consistently pursues the foreign policy of independence, self-reliance, peace, cooperation and development, diversification and multilateralization of relations. It gives priority to ties with neighboring and major countries as well as important partners, actively and proactively integrates into the global economy, and joins regional and global cooperation mechanisms, particularly ASEAN and the United Nations. The maintenance of traditional friendship and the stable, healthy and sustainable development of comprehensive strategic cooperative partnership with China for the sake of the two nations, the region and the world is a consistent policy, a strategic choice and top priority in the diplomatic policy of the Vietnamese Party and State, he said. The PM proposed facilitating high-level visits and exchanges between Parties, legislatures, trade unions and people, extending partnerships across the fields of national defence-security, diplomacy and coordination at multilateral forums while encouraging collaboration between localities, enhancing border management in the mainland, and controlling disputes at sea to maintain maritime peace and stability. PM Phuc straightforwardly exchanged viewpoints on existing problems in some economic-trade cooperation aspects between the two countries. He stressed that both sides need to urge their agencies and businesses to actively discuss and remove hindrances so as to boost economic and investment relations in a balanced and sustainable manner. He asked China to cooperate in implementing practical measures to gradually balance bilateral trade. It should continue importing goods that Vietnam has advantages in, especially agro-forestry-fishery products, and soon license Vietnam’s export of its meat, dairy and processed juice products to China. Regarding investment cooperation, he emphasized that in its ongoing sustainable development strategy, Vietnam attaches importance to high technology, effectiveness and environmental friendliness. He asked China to increase investment in Vietnam, particularly in hi-tech agriculture, machinery production, support industries, and renewable energy. It should expeditiously implement the additional loan worth 250 million USD for the Cat Linh-Ha Dong urban railway project in Hanoi, while ensuring the project’s progress and quality to put the facility into operation as scheduled. China should also soon complete the planning of a standard gauge railway project linking Lao Cai, Hanoi and Hai Phong. He also suggested the country consider the signing of an agreement on financial management of the two countries’ infrastructure investment projects using preferential credit so as to ensure the effectiveness and capital disbursement for those projects. The Vietnamese Government leader affirmed that his country will actively promote projects connecting the framework of the “two corridors, one belt” with the appropriate contents in the “one corridor, one road” initiative on the basis of ensuring feasibility and suitability with both sides’ demand. He asked the two sides to continue intensifying cooperation in regulating the released water volume in the upper Mekong River in the dry season, soon discuss the continued use of the hotline on unexpected fishery incidents arising at sea, and coordinate in properly dealing with these issues. The two neighbors need to increase experience sharing in environmental protection and climate change response, while effectively carrying out agreements reached at the ninth meeting of the China-Vietnam joint science-technology committee, he added. They should also expeditiously discuss the signing of a new railway transport agreement, facilitate aviation cooperation, and create equality for each other’s goods and passenger transport vehicles to enter the other country’s territory. Additionally, they need to realise the tourism cooperation plan for the 2016-2018 period, improve tourism services, and ensure order and safety for travel activities, the Vietnamese PM said. In terms of sea-related issues, he underlined Vietnam’s consistent viewpoint of persistently resolving East Sea disputes by peaceful measures in line with international law, including the 1982 UN Convention on the Law of the Sea (UNCLOS), and respect diplomatic and legal processes. In the face of recent complex developments at sea, he asked both sides to seriously comply with the agreements and common perceptions reached by the two countries’ leaders, including the agreement on basic principles guiding the settlement of sea-related issues. They need to respect each other’s legitimate interests which are in accordance with the UNCLOS, well control sea-related disagreements, and avoid actions that can complicate or expand disputes. It is necessary to promote negotiation mechanisms so as to soon attain substantive progress, satisfactorily address fishery-related issues, and continue fostering cooperation in search and rescue. They should also join hands with ASEAN countries to comprehensively and effectively implement the Declaration on the Conduct of Parties in the East Sea (DOC), as well as build and finalize a code of conduct in the waters (COC) in 2017 on the occasion of the 15th anniversary of the DOC signing, the PM added. 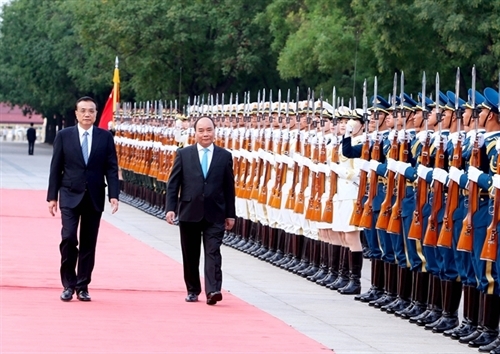 For his part, the Chinese Premier confirmed China attaches much importance to developing rapport with Vietnam and persistently follows the motto of friendly neighborliness and comprehensive cooperation with a long-term stability with Vietnam. He said China does not mean to run trade surplus with Vietnam and is willing to promote the balance of bilateral trade, seek measures to address the existing problems and encourage Chinese businesses to increase trade ties with Vietnam and expand investment in the country. China will also work with Vietnam to control effectively maritime disputes and maintain the general relations between the two countries as well as peace and stability in the East Sea, he affirmed. After talks, the two PMs witnessed the signing of cooperation agreements, including the agreement to extend the supplementation to the five-year plan for Vietnam - China economic-trade cooperation in 2017-2021; the economic and technical cooperation agreement on the provision of refundable aid packages; and the framework agreement on the additional loan of 250.62 million USD for the Cat Linh - Ha Dong urban railway.